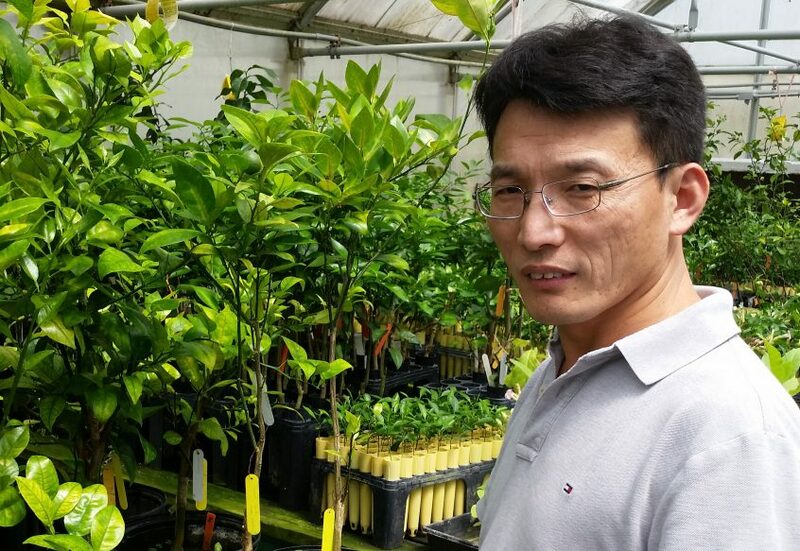 Wang at the Citrus Research and Education Center (CREC) in Lake Alfred, Florida. Photo provided by the CREC. GAINESVILLE, Fla. — A chemical treatment known as a bactericide could help preserve citrus trees from the potentially deadly and costly greening disease, a new University of Florida Institute of Food and Agricultural Sciences (UF/IFAS) study shows. Citrus is estimated as a $10.9 billion-a-year industry in Florida and the finding could be key to helping the state’s citrus growers and its economy. Citrus greening has cost Florida $3.6 billion in economic damage since it was first discovered in 2005, according to previous UF/IFAS studies. It is projected that more than 80 percent of citrus trees have been infected by greening. 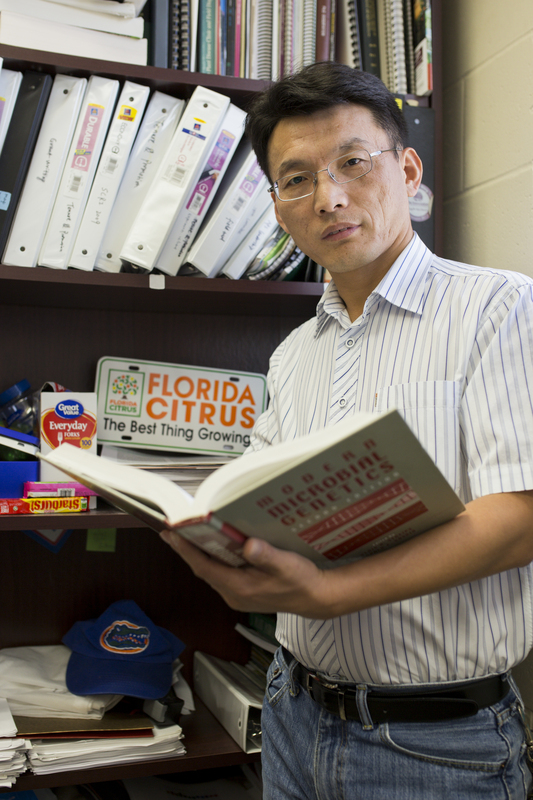 Nian Wang, a UF/IFAS associate professor of microbiology and cell science, led the latest study, which found that when a bactericide – in this case, oxytetracycline – is injected into the trunk of greening-infected citrus trees, it helps keep the trees alive by thwarting greening, also known as Huanglongbing, or HLB. Another advantage: Results from the study show that trunk injections were successful in delivering bactericides not only to leaves but to the diseased root system of infected trees, resulting in reduced bacteria levels in both leaves and roots for up to nine months. “Using trunk injection technology, you can probably treat the HLB-diseased trees one time per year and have good control,” Wang said. The process costs about $2 to $4 per tree for labor and material, UF/IFAS researchers said. At $4 per tree, figuring an average of 140 trees per acre for oranges, that’s $560 per acre, as estimated by UF/IFAS economists. Wang’s study is published in the Phytopathology Journal, http://bit.ly/2c6ZaBl.